The late Charles M. Schulz's daily syndicated and Sunday comic strip ran from 1950 to 2000, and continued with reruns afterwards. The adventures of a boy named Charlie Brown embodied by his meek, nervous and self conscious demeanor spoke to everyone because despite his failures, Charlie Brown never lost hope that things will get better. The cartoon was not only responsible for the four panel strip now standard in today's daily comics, it also broke the barriers of adding diversity in it's stories and characters. There were memorable supporting players like Lucy, her brother Linus, piano prodigy Schroeder, and Pig-Pen. But the most popular was Charlie Brown's beagle Snoopy and his little bird buddy Woodstock. Television specials, movies and even musical theater productions brought the lovable series to a wider audience including the instantly recognizable jazzy signature theme song by Vince Guaraldi. Trombone Shorty provides the “wah-wah” voices for the adults in the movie. Director Steve Martino (Ice Age:Continental Drift, Horton Hears a Who!) and screenwriters Bryan Schulz, Craig Schulz (the son and grandson of Charles M. Schulz) Cornelius Uliano update the continuing saga of Charlie Brown for today's younger audience. In the story, Charlie Brown (Noah Schnapp) is smitten by the new red headed girl (Francesca Capaldi) who moved in across the street. 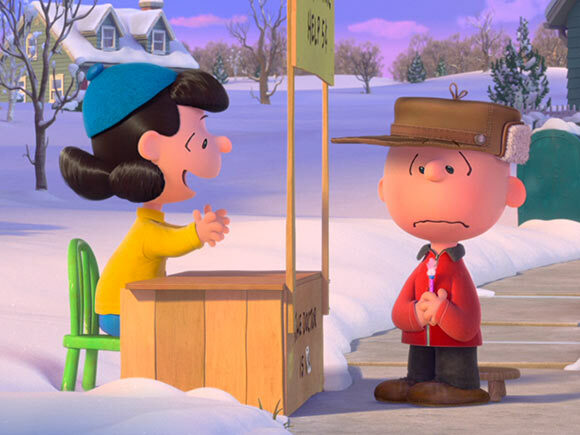 He does everything in his power to make the right impression on her, but since he's Charlie Brown, stuff inevitably happens. He even consults with Lucy at her nickel advice stand. She gives him a book on ten ways to be a winner. He tries to be a magician at the talent show, tries to bake cupcakes for the dance, tries to dance but ends up causing the fire sprinklers to be set off. Like his constant challenges at flying a kite that is eaten by the kite tree, everything that Charlie does is stymied by bad luck to the point where people come to expect it from him. His dog Snoopy (Bill Melendez) tries to help, but he's distracted by battling the imaginary Red Baron. This current movie touches on the origins of Snoopy's obsession with the World War I enemy pilot who has captured the beautiful Fifi (Kristin Chenoweth) who looks like Snoopy only with pink pompom ears and tail. Snoopy sits on top of his dog head while writing his story, that is taking form in this alternate universe. The brightly animated engagingly acted by real children's voices is filled with lots of slapstick humor that is entertaining without being mean spirited. The simply drawn characters are easy and familiar like “happiness is a warm puppy” kind of way. Outside of the aerial battles of Snoopy's Red Baron, there is no harm nor foul that comes with it. The lesson learned will be understandable to most kids and appreciated by most parents. This is probably the most perfect movie for families and a nice way to introduce the franchise to the younger set.